Please subscribe to our mailing list for promotions, free game expansions and news of forthcoming releases and projects. Educational Purchases: we accept purchase orders via email and offer discount for large orders. For further information please contact us. Read our tweets about the latest Symbotica news and promotions by following @symbotica on Twitter. We've been quiet for a while but we are working on a completely new website for Symbotica. The new site will be featuring exclusive downloads of game variations for you to play. We will also be announcing details of some exciting new games we hope to release during 2019. So please sign up to our mailing list to be kept up to date on our plans. My children loved Symbotica. They have played with it daily since we received it and I love watching them find and adapt new games each day, it's so versatile! Brilliant! So simple yet so addictive! 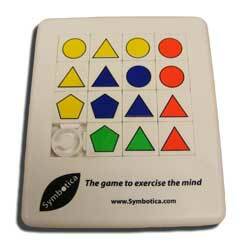 The children thoroughly enjoyed playing Symbotica over and over again. 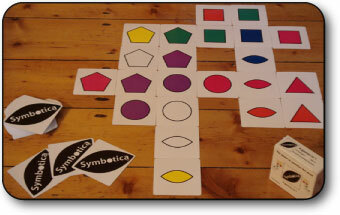 Symbotica is a card game for 1 to 6 players of all ages. The game is based around placing symbol cards so that either their colour or shape match their neighbours. We are pleased to announce the release of our second Symbotica themed game - the Symbotica Slider puzzle. Symbotica Slider takes the traditional sliding puzzle game and mixes it with the colour / shape matching idea of the Symbotica card game. 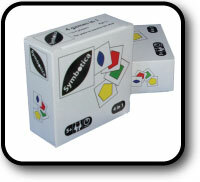 However, where a traditonal sliding puzzle only has one solution, Symbotica Slider has many. To give you a start we have provided some of the solutions for you. For some fun, and your viewing pleasure, we have put together a stop motion animation made using Symbotica game cards. A fun example of Symbotica being more than just the game in the box! Check back soon as we will be creating some more Symbotica Film Festival animations in the coming months.